Make sure you make home security a priority say Police. Police Scotland is once again urging the public to lock up and not give thieves a chance as the force continues to tackle opportunistic crime in the area. 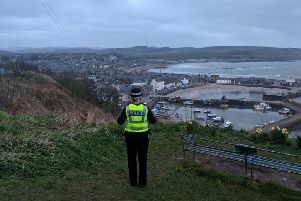 In recent weeks acquisitive crimes have been reported across numerous locations across the North East, including in rural communities, towns and within Aberdeen. As well as urging the public to be cautious, officers are also asking motorists who work shifts, for example delivery drivers or taxi drivers, to keep an eye out for suspicious vehicles or activity while they are out - particularly overnight - and to let the force know as soon as possible. Detective Inspector Stuart McAdam said: "Christmas is a busy time of year and it may be that you're away for the weekend or on a night out. I would urge you to take a couple of extra minutes before you leave your house to make sure all your doors and windows are locked, including any vehicles, and to put any additional security measures in place whether it be timed lights or setting alarms. "My advice stands even if you are at home. In some cases the perpetrators are simply trying front and back doors in the hope they are open, and grabbing any keys left nearby. They can gain entry without you even noticing and flee the area quickly and easily, in some cases with your stolen vehicle. "In the wrong hands your vehicle is a lethal weapon, and the criminal behaviour that comes with such crimes will continue to escalate if they are able to gain easy access to your property. "North East Division is committed to tackling crime as a priority under Operation Magpie and a huge amount of preventative and proactive work is being carried out on a daily basis, including using all resources available to us. "Extra patrols are being carried out however if drivers who are working through the night can be another set of eyes and ears for us, that information could be extremely valuable to our enquiries. "If you have noticed or notice any suspicious activity - day or night - please let us know as soon as possible. Look out for unfamiliar vehicles or people and most importantly, tell us. There won't be any issue with officers attending a false call made in good faith. "Anyone with information should contact Police on 999 if it is an emergency, on 101, or Crimestoppers on 0800 555111 if you would prefer to remain anonymous."